I haven’t been to Jamaica. There’s my disclaimer. But, I love a restaurant in the city called Patio. I was craving those flavors but didn’t want jerk chicken. I wanted stewed chicken. So, I made this up. In a Dutch oven, heat 1 tablespoon of olive oil over med/high heat. Season both sides of the legs with salt, paprika, and a bit of the cumin. Place the seasoned legs in the pot and brown on both sides. Then add the rest of your ingredients. The broth should come up to at least the middle of the legs. 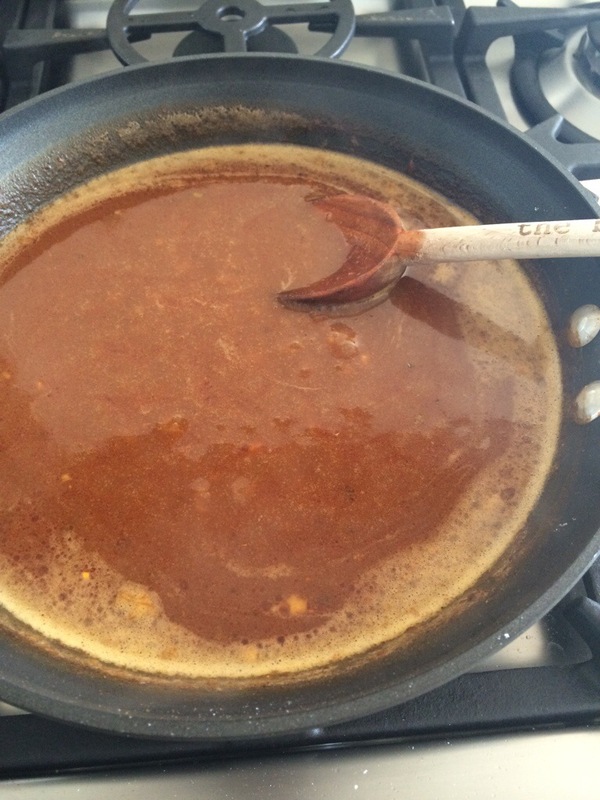 Cover slightly and stew (low gurgle not boil) by reducing the heat to low for 25 mins. Flip the legs and cook slightly covered for another 20 mins. Taste for salt. Served with tortillas, black beans, fried plantains, avocados, fresh cilantro and hot sauce. This was a huge hit! Enjoy! There’s a restaurant in Oakland called, Bakesale Betty. Funny enough, I’ve never set foot in their establishment but have eaten these infamous fried chicken sandwiches of theirs on a number of occasions (my friends brilliantly picked up a bunch for their son’s first bday party). The sandwich is delicious. I think the draw really is the slaw on top of the sandwich. Or is it the bread? Maybe it’s because it’s fried. Like, who doesn’t love fried? 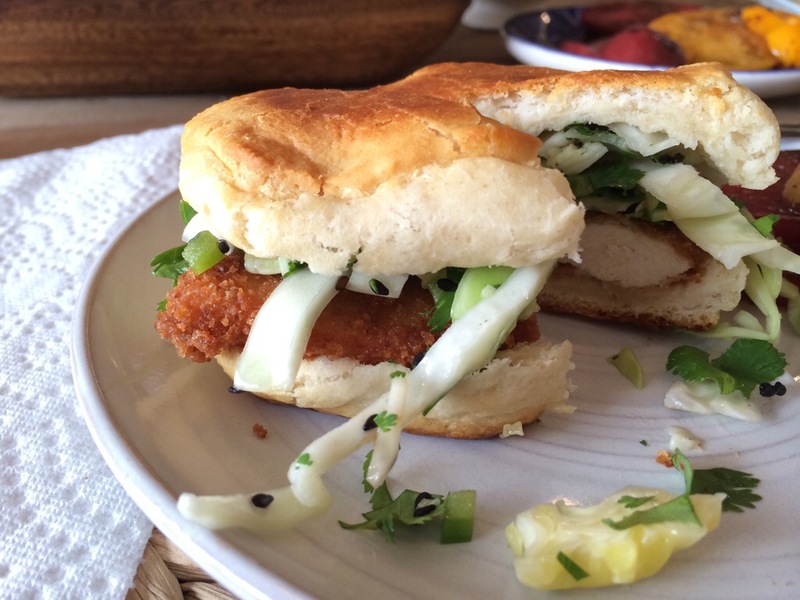 It’s definitely the combination of crunchy, spicy, vinegar with the comfort of the bread that made me want to create my version. This recipe is on regular rotation at our house. I hope you enjoy. Preheat your oven according to the biscuit instructions. Mix the 1/4 c veggie oils with vinegar and set aside. In one shallow bowl, mix egg and milk. In another bowl, mix panko, flour and salt. Heat your oil on medium in a pan -filling the pan about 1.5″-2″ with oil. I usually test to see if the oil is hot enough by dipping wooden chopsticks into the oil and looking for lots of tiny bubbles. I like to use large chopsticks to turn the fried chicken. Or you can just add a tiny pinch of the panko to check the oil readiness. It should bubble around the edges. Put the biscuits in the oven. Dip one piece of chicken into the egg mixture and then into the panko mixture. The panko should stick well to the meat. Don’t crowd the pan with too many pieces of chicken. You should have room around each piece to flip. But don’t flip in until you start to see the sides get golden brown. Work in batches. Taking the done pieces out and letting drain on paper towels. I also like to add a bit of salt to the freshly fried pieces of chicken. Sooo good. Don’t forget to keep checking your biscuits. Once done, take out of the oven and serve with chicken and slaw. I just put everything on the dining table and let everyone make their own sandwiches. 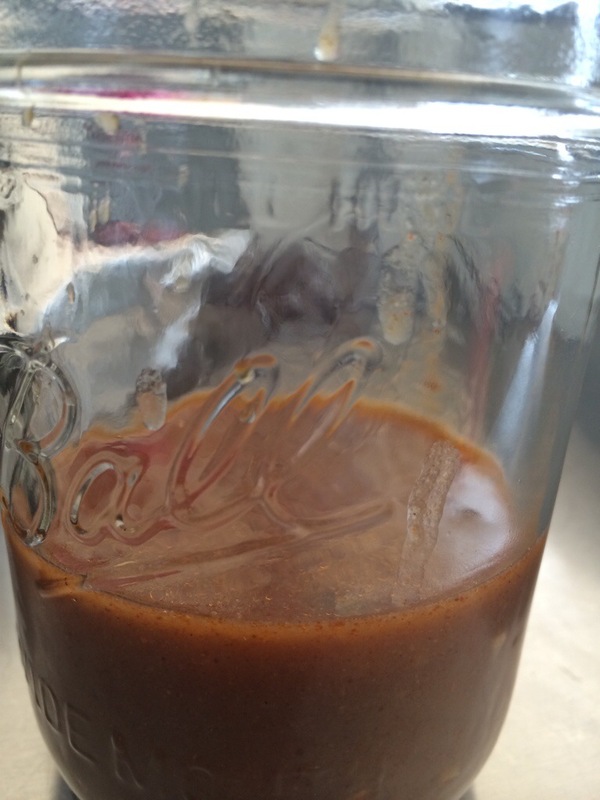 Did you know that enchilada sauce doesn’t have a tomato base? Or at least this recipe doesn’t. I was so surprised! Enchiladas seem complex to make but they’re actually really easy. I used to buy the sauce and add tomatoes and extra cumin to “make it my own”. That was until I tried to make the sauce myself. Amazingly, it’s even easier than opening a can and doctoring it up and it’s so much more delicious. Heat the oil in a large pan over med/high heat. Sprinkle the flour and whisk until smooth cooking for about one minute. Add the seasonings and garlic and whisk. Slowly add the stock stirring to avoid lumps. Cook and stir for ten to fifteen minutes. For chicken enchiladas, I seared three full, salted chicken legs. Then added some onions and cooked for a couple minutes. I added about 1/4 cup stock to the pan to deglaze and braise the chicken. simmer on low for another 20-30 minutes until the meat pulls from the bones. Shred the chicken and roll it up in some corn tortillas (we LOVE Abuelitas brand). I add a little cheese and sauce inside each enchilada before rolling them up. I place them in a tight row in a Pyrex dish. I then smother them with more sauce and top them with cheese. Save extra sauce to top the enchiladas on the plate. (I’m lactose intolerant so I just omit the cheese from my enchiladas) I put them in the oven at 350 and heat until the cheese is bubbling. Serve with a bit of cilantro and avocado and of course extra sauce. I went all out at this year’s annual 4th o’ July camping trip. No, I didn’t stay up late, hooting and hollering over charades. In fact, I was in bed before the kids most nights. And no, I didn’t start my day with Mary’s and continue with beers/wine until sundown. Rather, I prepped and cooked my toosh off. I made Jan’s cobbler, fried donut holes, made Schmitty’s chicken and taziki wraps and topped it all off with firepit pizza – which was by far, the biggest success. I’m still craving it. 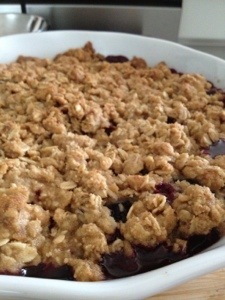 Next time you go camping or have a craving for delicious cobbler, donuts or pizza, try out these recipes. They were a big hit! Lightly butter a deep pie dish (or you can double the recipe and use a 9×12 baking dish). Put the berries in the dish. In a separate bowl, mix the next five ingredients. With fingers, squash in the butter with the mixture until its course and crumbly. Sprinkle the topping over the fruit and bake until top is golden brown and fruit is bubbly. Let it cool before diving in. This travelled really well in the cooler and tasted great chilled. Wisk everything together in a medium bowl. Reserve half the marinade. Out chicken in a ziplock bag with half the marinade and freeze if you’re going camping. 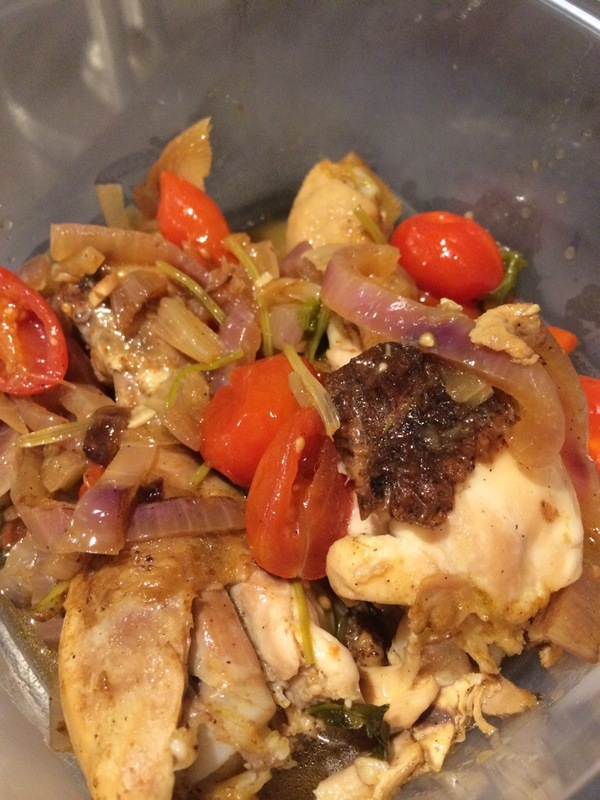 The night before heading out, put the tomatoes an onions and the other half the marinade in another ziplock bag and leave in the fridge. 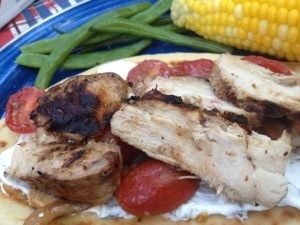 Grill off the chicken over the camp fire and serve with wraps, taziki and the marinated tomato mixture. 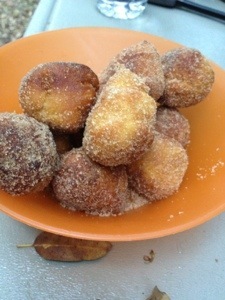 Put your sugar and cinnamon into the brown paper bag and set aside. Heat up the oil in a frying pan over med/low heat. Break each biscuit into four pieces and roll into a ball. Gently drop one hole into the oil. It should create bubbles instantly around the edges. Put the rest of your holes in the oil but don’t crowd the pan. You’ll need room to turn the holes over as they cook. As soon as they’re golden brown, drain on paper towels and then drop into the paper bag. Give ’em a little shake and then watch them get gobbled up. Cut up any toppings really thin (they don’t really cook). Roll out the dough – I just pulled on the sides until it was pretty even and rather thin. Rub olive oil on one side and place the oiled side down on the disposable grill. Set this on the campfire grate and stand watch. It’ll bubble and get chat marks. It should be done in about 2-5 mins. Remove from the fire and oil the top side. 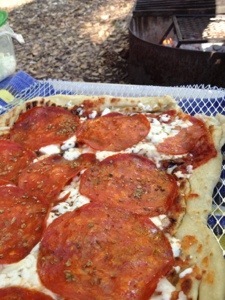 Flip the pizza and top the recently cooked side with sauce, cheese, toppings and a sprinkle of oregano. Top with a foil tent and place back on the fire. Cook for another 2-5 mins checking the bottom and rotating when necessary. Pull it from the fire. Cut it up. And wait for the OMGs.